Urban Mosaics, the startup t-shirt manufacturer have announced $19.99 holiday special off on its two new wearable art T-Shirt designs, which involve the bountiful use of organic cotton. We’re really excited about the release of our two new shirts just in time for the Holidays. 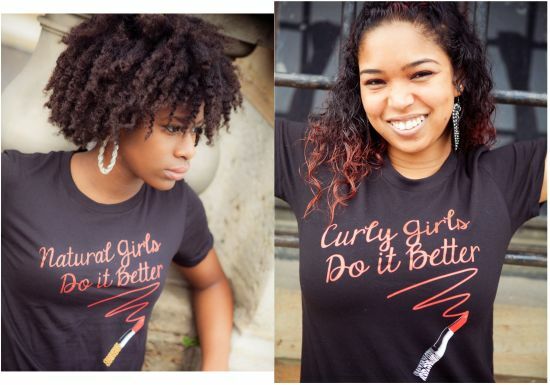 The two new designs are printed on a black T-Shirt canvas of 100% organic cotton offering fun, chic and empowering messages about curly and natural hair. Said Stacy Edey, owner and founder of Urban Mosaics. She also stated that additional t-shirts on Urban Mosaics website will be placed on sale. She confirmed that the eco friendly designs are printed on 100 percent organic cotton shirts and are shipped to customers in recyclable mailing tubes. Urban Mosaics’ Holiday Haul for newly released t-shirt designs, “Natural Girls Do It Better” and “Curly Girls Do It Better” runs from Dec. 19-26. A portion of the proceeds will be donated to Stivers School for the Arts.